Mud runs and obstacle-course races are hugely popular and attract a wide range of participants. Learn how to capitalize on this growing trend by offering profitable small-group training programs designed to help clients train for specific events throughout the year. Have you or any of your clients recently participated in a mud run? If so, how did you train for the specific demands of the race? Let us know your training tips in the comments section below. Wading through chest-high water, swinging along monkey bars, climbing over walls, low-crawling through mud and jumping into a freezing ice bath. While these might seem like the types of challenges faced by only the toughest soldiers competing for a coveted special-forces position, these are, in fact, just a few examples of obstacles from popular race-style events, commonly referred to as mud runs, that are changing the recreational fitness landscape. Standard race events such as 5Ks, 10Ks and even marathons place a significant emphasis on cardiorespiratory fitness. Mud runs and obstacle-course races, however, require aerobic endurance plus muscular strength and the ability to work anaerobically at high intensities. Clients who value exercise and physical activity as part of a healthy lifestyle generally want to challenge themselves to determine their fitness level. Competing in and finishing a challenging obstacle course provides a sense of accomplishment and toughness not offered by traditional road races. While mud-run races are not new, there has been a recent explosion in the popularity of these and other obstacle-course events. With names like the Warrior Dash, Spartan Race and Tough Mudder, these events are becoming extremely popular among exercise enthusiasts. (Note: For purposes of this article, mud run and obstacle course refer to the same type of event—an off-road running race that includes navigating a variety of challenging obstacles to complete the course.) 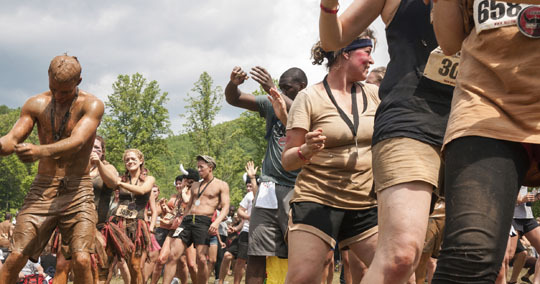 For example, in 2009 the first Warrior Dash held in Joliet, Ill., attracted just 2,000 participants; today, it has grown to include 33 separate events worldwide, with an estimated 650,000 participants. Likewise, the Tough Mudder series of races has evolved from 14 events in 2011 to 36 in 2012, with an estimated 500,000 participants. Event names combined with featured obstacles are designed to support specific themes, which create a fitness experience that is difficult to replicate. For example, a number of event courses races feature military-style obstacles that allow participants to experience the challenge of military training without committing four years to armed forces or risking deployment to a dangerous war zone. Both the Spartan Race and Tough Mudder events advertise courses designed by former members of the British Special Forces. The Boot Camp Challenge at the Marine Corps Recruit Training Depot in San Diego allows participants to run a scaled-down version of the obstacle course used in basic training with verbal “encouragement” offered by real Marine Corps drill instructors. Some races go so far as to borrow from current pop-culture phenomena. Building on the zombie-related subculture made popular by the comic book and television series “The Walking Dead,” the Zombie Run challenges participants to navigate an obstacle course while being chased by volunteers dressed as the undead that are trying to steal flag football–type flags from runners. This allows racers the opportunity to experience the challenge of trying to survive a zombie apocalypse without actually having to face hordes of flesh-eating cannibals. Most obstacle-course races promote camaraderie and a social atmosphere that often includes parties with beer and bands after the event (and requisite shower). Joe Decker, the current World Guinness record holder for the ‘World’s Fittest Man,’ author and a two-time winner of the Spartan Death race, runs the Gut Check boot-camp program in San Diego, Calif., and makes the point that fitness enthusiasts are always looking for new and different challenges to overcome. Mud-run and obstacle-course races can also be seen as a reflection of the overall fitness landscape, which has recently shifted from focusing on training volume to training intensity as the most important variable of an exercise program. Video-based workout programs such as P90X and Insanity, the rapid growth of Crossfit and Mixed Martial Arts (MMA) training studios, along with the ongoing popularity of boot camp-type outdoor programs, demonstrate fitness enthusiasts’ increasing demand for hard-charging workouts that provide results. The skyrocketing popularity of mud runs and obstacle-course races presents ACE-certified Personal Trainers with a unique business opportunity to design small-group training programs that will not only help improve client fitness levels, but will provide an experience that cannot be easily replicated. Your first step is to identify a local mud run or obstacle-course event that is three to four months away, which will give you at least four to six weeks to properly advertise and market the training program to prospective participants. Next, identify a core group of fitness enthusiasts who want to challenge themselves with an obstacle-course race. And finally, develop a progressively challenging eight-week workout program based on the physical demands of the event. Still not convinced of the potential financial rewards of capitalizing on this trend? According to news reports, the parent company of Tough Mudder generated $22 million in revenue in 2011 and is projected to earn approximately $75 million in 2012. The average registration for a Tough Mudder event is $125, which indicates that, not only is there a strong demand for this type of challenging competition, but participants are willing and able to pay for it. This is important for personal trainers—if an individual is willing to make a substantial financial commitment to spend a weekend morning slogging through mud, then they will likely consider investing in a small-group training program to prepare for the experience to be money well spent. This is such an attractive business opportunity that the parent company of the Tough Mudder events recently teamed up with the 24-hour Fitness health club chain to start offering boot camps to help people prepare for Tough Mudder events. These one-hour classes are free to members and $15 for non-members. Given these indicators, taking the time to design and market a small-group training program to prepare clients for an upcoming event in your area appears to be a wise investment. Developing a training program for a mud run or obstacle-course race requires taking the time to examine the event course (many races list most of the obstacles on the course on their Web site to help participants prepare, but do leave a couple of unknown obstacles for a race-day surprise). In general, participants will need both aerobic endurance and the ability to quickly recover from obstacles that challenge anaerobic strength. A number of the obstacles, such as swinging on monkey bars or climbing over a tall wall, require upper-body strength for successful navigation; therefore, a training program should feature specific exercises to address this need. Additionally, some obstacles will require teamwork to overcome, so be sure to include various partner and group drills in the training program. 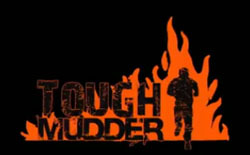 The Tough Mudder events advertise courses with approximately 25 obstacles over a 10- to 12-mile course (variability of the event venues makes it difficult to have the exact same course at each different location). This means that a participant can expect to perform one obstacle about every one-half mile or approximately one kilometer (1 kilometer = 1,000 meters = 0.6 miles). If participants are expected to overcome an obstacle every 1,000 meters or so, then it becomes more important to emphasize high-intensity intervals for running as opposed to long slow distance training typically performed for endurance events. High-intensity interval training (HIIT) is arguably the most effective way to prepare for an obstacle course race that requires bursts of running at an intensity near the second ventilatory threshold (VT2), combined with short recovery intervals. HIIT is an effective way to boost both anaerobic endurance and aerobic recovery. A small-group training program that focuses on HIIT for running, combined with total-body exercises that progressively become more challenging from one week to the next, should adequately prepare participants for successful completion of an event. To prepare for the specific challenges of running 800–1,200 meters at a time between various obstacles requiring strength and dexterity, alternate between circuits of three to five strength exercises (minimal rest periods between each exercise) and bouts of running following a HIIT protocol. Following is the initial phase of a sample workout for an eight-week program to prepare for a 10- to 12-mile obstacle-course race The workout program should become progressively more challenging leading up to the event. The most efficient way to accomplish this is to increase the distance of the runs and the times of the work intervals, while reducing the time of the recovery periods. This particular workout, which uses TRX Suspension Trainers, medicine balls and ViPRs, is designed for an outdoor small-group training program that meets three times a week; exercises will be performed for time rather than a set number of repetitions. For personal trainers looking for a way to enhance their business and establish a unique brand identity, developing small-group training programs for mud runs and obstacle-course races might be an effective solution. Be sure to train for the specific challenges of the event and focus on the real purpose of each race: bringing like-minded fitness enthusiasts together for a unique exercise experience. Pete McCall, M.S., an Exercise Physiologist with ACE, creates and delivers fitness education programs to uphold ACE’s mission of enriching quality of life through safe and effective exercise. He has a master's degree in Exercise Science and Health Promotion. In addition, he is an ACE-certified Personal Trainer and holds additional certifications and advanced specializations through NSCA and NASM. McCall has been featured in The Washington Post, The New York Times, Los Angeles Times, Runner’s World and Self. ACE Exercise Physiologist Pete McCall weighs in on how continuing education impacted his career. While many personal trainers may view courses and workshops as another expense, it’s more reasonable to think of it as an investment in business. Check out one trainer’s story of how it directly impacted his business’ growth. You may only see your clients once or twice a week, so encouraging them to keep up their activity outside of sessions can be a challenge. Give them ideas on how to create a circuit workout that suits their fitness needs by simply using equipment they can find in their homes or neighborhoods. Where Do I Start With My Obese Clients? Personal trainers whose everyday lives revolve around health and fitness may find it difficult to relate to clients who struggle with their weight. If you’ve found yourself in that category, check out these five strategies you can use to build rapport and connect with obese clients. Dr. Michael Mantell, ACE Senior Consultant for Behavioral Sciences, explores five steps you can start using now.